Welcome to the world of making natural beauty products. 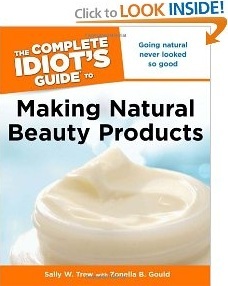 This book explains why it's better to go natural and opens your eyes to some of the undesirables used in the commercial beauty products. It covers everything you need to know about oils and butters used to make natural beauty products, along with essential oils and herbs. This book looks at the essential butters and oils and the basic properties of each so you can decide what you want in your recipe. It takes a walk through the herb garden where you'll learn what the herbs can do and how to make infusions and tinturers. There are many benefits to making your own beauty products. You get to control what ingredients are, and more importantly are not, used in them. You can create the colors and scents you love, and by avoiding nasty chemicals, you protect the earth. Arlena Flanders of Staten Island, NY says, "I have seen several Natural Beauty Product Recipe Books on the market, but this is by far the best. This book is easy, comprehensive and packed with information for the novice or seasoned bodycare product maker. This book covers several different topics and areas of making natural body products. "This book teaches you how to make products from scratch for your hair, face, body, feet and it even covers the subject on how to make mineral make up, lip balms and glosses. This book has a wealth of information from the types of oils, butters and additives to use. The book also covers the subject of labeling cosmetics for sale, which is vital in the cosmetic making industry. I think this book is a must have. If you're thinking about getting this book, you won't be dissappointed." Webmaster message: I posted this article because I think natural home made beauty products would be a great business to start. Why do commercial beauty product manufacturers put so many harmful chemicals in their products? They need the harsh chemicals to give their products a long shelf life in order to generate maximum profits. But because you can produce your beauty products in smaller quantities and you can provide personalized service, your products don't need such a long shelf life. The place to start selling your products, besides friends and family is local swap meets, flea markets, and crafts fairs. I can't tell you how many stories I've read about successful people who started out selling at flea markets. And with your own natural recipe you'll have your trademark beauty products that you can be proud of. Click here for more information.